The charity behind a proposed £80m dinosaur-themed museum on the Jurassic Coast has been turned down for £16m of Heritage Lottery Funding (HLF). Jurassica would be built in a semi-subterranean cavern in a 35m (114ft) deep quarry on Portland, Dorset. Set under a translucent roof, it would depict the coast 150 million years ago. Mike Hanlon, the project's founder, said the charity was "disappointed" with the decision but would reapply for HLF funding later in the year. 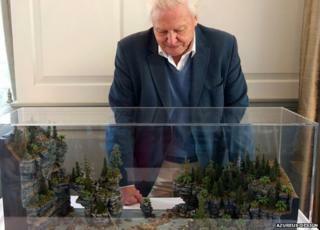 Sir David Attenborough is the project's patron and the Eden Project's Sir Tim Smit is its trustee. A model of the planned museum, complete with Jurassic seashore and animatronic swimming dinosaurs, was unveiled in February. An HLF spokeswoman confirmed the organisation had been "unable to support the project" but did not give any further details. In a statement, Mr Hanlon said: "We are disappointed that we have missed out in this round of funding, but we retain the support of our private sector backers and will be reapplying for lottery funds later this year. "The HLF officers and board have asked us to strengthen our bid in a number of areas, including the creation of a comprehensive inventory of fossils and other heritage material from the Jurassic Coast." He said work on Jurassica would continue, and added: "We do not foresee this decision having any effect on our plans to open our gates in 2021." The 153 km (95 mile) Jurassic Coast World Heritage Site, which begins in East Devon and stretches to Old Harry Rocks near Swanage in Dorset, attracts about 12-15 million visitors a year. The attraction has the backing of the Royal Society and the Natural History Museum. It has been awarded a £300,000 grant by the Dorset Local Enterprise Partnership, as part of the Government's Local Growth Deal.